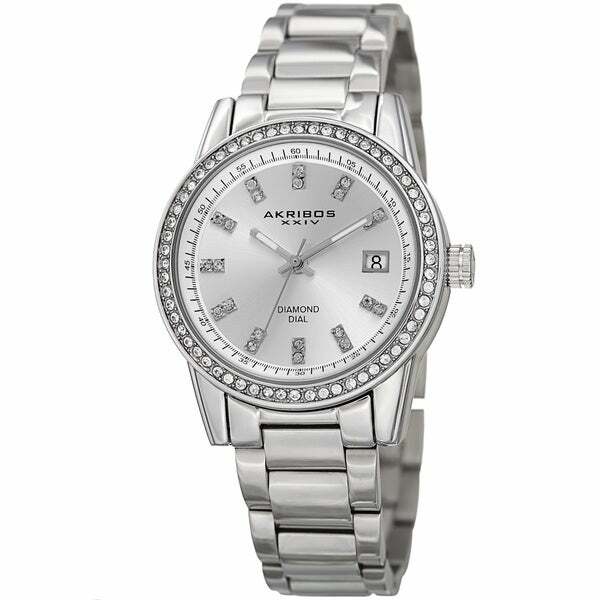 This women's Akribos timepiece features sparkling crystals set into the bezel and a stainless steel bracelet. The radiant sunray dial is adorned with hand set genuine diamond markers. Powering this watch is a precision quartz movement. Needed to replace my large face stainless watch and this is perfect. Can be dressed up or dressed down. Happy to find something that was not too “over the top”. Beautiful watch.. looks expensive! So happy I bought this watch. I highly recommend! The watchband was too large so I took two links out and then my wife couldn’t get it over her hand. I put one back in and still couldn’t get it over her hand. The band isn’t adjustable. I sent it back weeks ago and haven’t received a refund or had any correspondence. Don’t know what to do now, guess I’m screwed. I won’t order anything from overstock again! To bulky outside of the face looks more like a guys watch not my style but someone elses . I like more. Of a ladies watch. Nice watch for the price! Love love love this Beautiful watch!